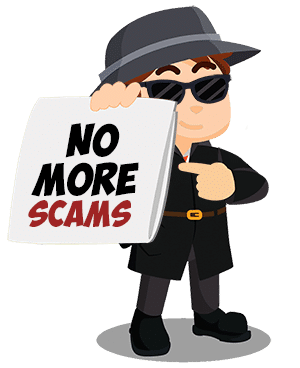 >> Kids Earn Cash – Scam or Legit? Truth Exposed! Kids Earn Cash - Scam or Legit? Truth Exposed! I am going to share with you today all the things about Kids Earn Cash that I found in my thorough research. I can guarantee that these facts come from the verified and most reliable sources, but I welcome you to double check them with your own methods. You will be guided appropriately on the next course of action to take regarding this online business opportunity. Check out this program instead as an alternative. Kids Earn Cash introduces itself to be an online money-making platform specifically for social media influence-ers. On the surface, Kids Earn Cash looks just like another GPT or paid survey site. You can make money by taking part in surveys, completing simple tasks, or by promoting your affiliate link. 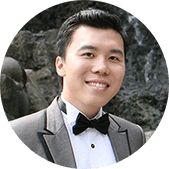 This company presents a simple formula to earn money online and that anyone has the chance to do so. How do Kids Earn Cash Work? Kids Earn Cash rewards you with huge payments (at least $25) just by completing very simple surveys and offers. Other than surveys and offers, there are other online tasks that you can complete in the Task Wall with payments ranging from $25 – $50. You can earn an easy $50 just by creating a personal video promoting Kids Earn Cash to other people. The length of the video isn’t specified. What is only required is your video link and voila! $50!! Once you become an official member of Kids Earn Cash, you will be automatically given a personal referral link. By posting your link in different social media platforms, e.g., Facebook, Twitter, and Instagram, you will have the potential to earn $2 every time someone clicks your link. An additional $10 for every new account sign-up. You can join Kids Earn Cash and start racking up your earnings by merely completing a sign-up form on their website. You will also be rewarded with a bonus $25 just by completing this process. There is no need to wait for email verification or confirmation. Kids Earn Cash does not verify your email account which means once you have completed the sign-up, you can start earning money. The company claims that you can get your payments in flexible options. You can either choose to get paid with cash upfront, thru PayPal, Western Union or, wiring your earnings to your bank account. NADA! Instead, I found a lot of red flags which I will discuss in a moment. I have reviewed many business opportunities, and I can honestly say that base on the results of my research about Kids Earn Cash, I want nothing to do with this company. Okay, as you might have already known and to those who are familiar with my articles, I want to remain unbiased on any of my reviews. Although I can totally understand where the rumors of Kids Earn Cash scam are coming from, I will merely present to you the red flags about Kids Earn Cash. You can draw your own conclusion afterward. 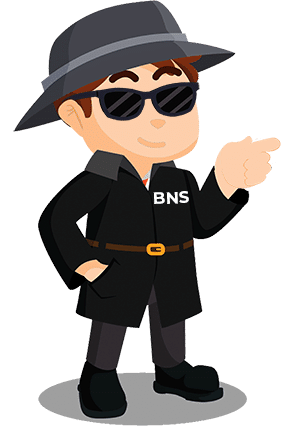 One of the most basic information any legit company will disclose to their patrons and members are the identities of the people behind the company. This is one of the requirements to be considered a trustworthy name. Not only Kids Earn Cash does not provide the names of certain individuals behind its platform, but their website also does not even mention a parent company. If you are interested to learn about Kids Earn Cash’s company background, you may find that impossible to accomplish. Kids Earn Cash claims to pay you decent money in exchange for completing various mundane tasks online. 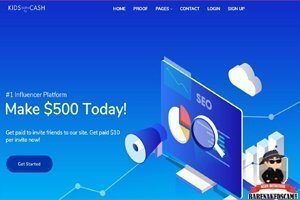 They even claim that anyone can earn up to $500 in a single day! The chance of this happening in the real world that we are currently living right now is close to zero (I leave a few percents for a miracle) and this is clearly just a hype. The third red flag I would like to raise about Kids Earn Cash are the obvious fake testimonies that they present on their website. Most of these success stories are dated way back to 2018 and 2017. These are all FAKE! I know calling a company’s success story and testimonial a fake is not a small thing but allow me to present my proof. You can verify these information by taking a look at Kids Earn Cash's official website. So hoping to get more reliable bits of information about Kids Earn Cash, I decided to visit "Whois" - a verified platform to provide crucial information about certain websites. As you can see, the website Kids Earn Cash is no more than two months old (as I am writing this review). Then clearly, those testimonies that date back to 2018 and 2017 were no more than a bunch of fabricated lies and sham. Kids Earn Cash also claim that they have already paid $27.3M to their 75K members. For a company that has been operating for only over a month, this numbers don't add up. Kids Earn Cash is kind enough to provide its members with contact information just in case there will be issues to arise. However, the email and contacts they provided were either nonexistent or fake. Here’s my proof. As you can see, the contact information is rated as BAD. In addition to the false contact information, there is also no FAQ section on Kids Earn Cash website. Meaning, you cannot expect customer support in any kind. Other than the fake testimonials you can find on Kids Earn Cash website, there is actually no real people that claims to have received payments for their efforts. Moreover, if you look closely at those testimonials on their website, each of them does not even have a proper image of the person. If you have seen other Kids Earn Cash review before this one, it is highly likely that they are playing the same tone to this one. You can also find plenty of complaints and negative Kids Earn Cash review coming from real people who claim to be not paid by this company. When you search for Kids Earn Cash, do not be surprised if you would come up with almost similar sites with the same marketing strategy, earning potential and practically the same name. I don’t have enough information to verify the truth about this but many people, including legit review sites, claims that Kids Earn Cash is just another branch of a previous similar scams. Do you think there really is a Kids Earn Cash scam going on? If you have some valuable information to share about this topic, please help us enlighten our readers by sharing your thoughts in the Comment Section below. I also encourage Kids Earn Cash members who happens to read this review to shed some light about these matters. It is pretty standard for any platform claiming to be an influencer to have a respected social media presence. However, Kids Earn Cash even fails accomplishing this. Kids Earn Cash does not have any social media account, and I even found out that its Twitter account is suspended! Kids Earn Cash may look like an ordinary GPT site that allows you to make money by completing small online tasks. One of the most effective ways for these scams to lure people in is by offering free membership sign-ups. Yes, just like Kids Earn Cash. Scammers nowadays are not only after your money but also your personal information. Your personal details such as phone number and email account can be sold to third-parties. how much have you earned (you just joined, what earnings do they mean). Oh, I get it. They ask you to LIE on your video and hype more people to join their platform. Click Here: 100% Legit Online Business You Can Start Today For Free! Is Kids Earn Cash a Scam? Although this company has not been officially tagged yet by the FTC and authorities as a scam, it is very likely to be one. Legit GPT sites and other online business platforms may have some flaws, but they do not have as many red flags as Kids Earn Cash. Do I Recommend Kids Earn Cash? No, and I would even tell you to stay away from this company. Don't fall for it! Do not give your PayPal, your bank account and other delicate personal information. 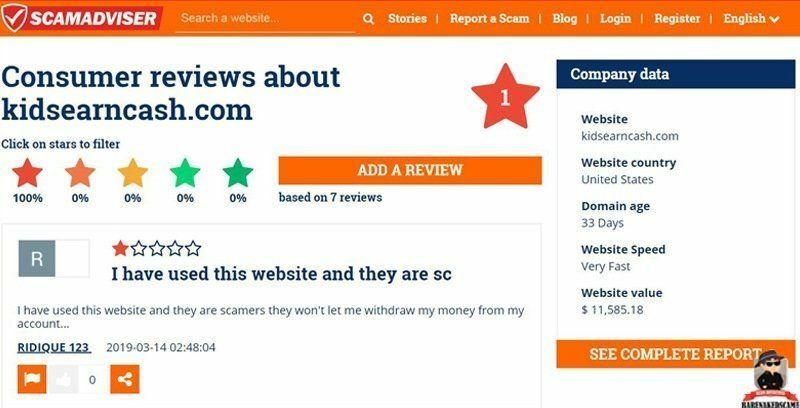 Share this KidsEarnCash review to them before its too late and irreversible damages had been done. Other than this is likely a scam in disguise to get your personal information; Kids Earn Cash takes advantage of you by making you actually work for them for free! You complete the offers which they will get paid from the third parties involved, and you aren't even getting a dime for it. Other than that, by sharing their affiliate links, you are essentially providing them free advertising, and you are acting as their lead generation system. I suggest that you immediately removed them and change your passwords, especially for your Paypal and email account. There are many legitimate ways to make money online that you can try. Did you consider taking a look at Affiliate Marketing instead? However, if you are a fan of these kinds of opportunities, get into something legitimate. There are plenty of legit paid survey sites and GPT sites similar to what Kids Earn Cash claims to be. You can also see which of these GPT sites made it to our Top 10 Paid Survey Sites in 2019. This is my #1 Recommended Online Business Program that works even for complete beginners. Than you for taking the time to read this review. If you find it helpful, kindly share it to the people you know who might be needing this kind of information right now. Showing this to them could potentially save them from becoming a victim of yet another scam in disguise. If you have more reliable information about any Kids Earn Cash scams going on, please share them to our readers in the Comment Section below.